This is my Achiote Butter Basted Turkey. This year we named her Frieda and of course there is a story that goes with that. The story starts six years ago when I was out buying a Christmas gift. I was looking at a set of folding saw horses when the woman beside declared they were the ideal gift for her family gift exchange. Her gift needed to start with the letter F. They started this idea with the letter A and on this year they had to buy gifts that started with the letter F. Folding saw horses met her criteria. I liked the idea of some criteria for the gift exchange so convinced my family to start the same tradition. That year we started ours with the letter A. A few years later I heard someone talking about the time and care we give to our turkey. The idea to name it came from that and we would use the same criteria as our gift exchange. I would name my turkey a name that began with the same letter of the alphabet as our family gift exchange. Now, six years later, all of our family turkeys this year will be given names that begin with the letter F. All gift exchange gifts must begin with the letter F. Next year will be the letter H in 19 years we’ll start back at the letter A. So that is the story of how Frieda got her name. Turkey is a commitment. It is big and requires a some equipment. You can make a point of using these items throughout the year but you definitely need them for your Turkey Feast. -This moderately priced turkey roasting pan that has lasted me almost ten years. -A high end turkey roasting pan would be good for serious turkey families. -I use this gravy separator and actually saved the instructions because I don’t use it very often. -My mom always says you can’t overcook a turkey, but you definitely need an instant read meat thermometer so you don’t undercook it. Frieda the turkey was lovingly rubbed with a mixture of achiote paste and butter. This Latin American paste is an unusual pantry ingredient made with annatto seeds, vinegar and spices. It provides a bright orange hue and a unique earthy taste to the turkey. Before you commit to a whole turkey recipe try it in this recipe for achiote chicken, that is how I fell in love with this ingredient. My Achiote Butter Basted Turkey named Frieda was stuffed with Cornbread Chorizo Stuffing and cooked to perfection. I served it with a generous portion of Ancho Chile Gravy thickened with masa harina. 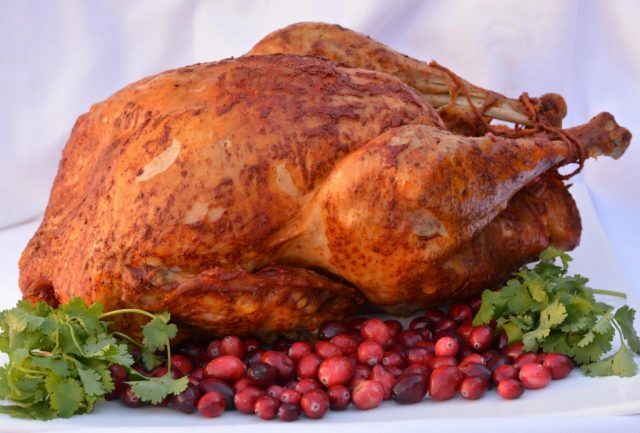 Do you name your turkey or did you try this recipe for Achiote Butter Basted Turkey? Let me know in the comments below. Mix butter and achiote paste together. This can be done the night before and left at room temperature. Remove the turkey from the fridge for 1-2 hours before starting. Wearing gloves, rub the achiote butter over the entire turkey. The butter will quickly harden on the cold turkey so microwave the remaining butter for 10 seconds if needed. You can also put the turkey in the oven for 5-10 minutes after the butter is on it, uncovered, to help the butter melt. Remove the turkey from the oven and finish spreading the butter with your hands or a silicone brush. Place turkey on a rack in a turkey roasting pan. Tuck wings under the turkey. Using kitchen string tie the legs together to help hold its' shape. Pour 2 cups of chicken stock in the bottom of the pan. Add the onion, carrot and celery to the pan. Cover with foil and roast in preheated oven until it reaches 160°F on a meat thermometer. A general guide is 15-20 minutes per pound. Check the turkey every hour and baste it with the juices in the bottom of the roaster. Add the more chicken stock as needed. If not nicely browned remove the foil for the last hour of the cooking time. Allow the cooked turkey to rest, covered with foil, for 30-45 minutes before carving. Make ancho chile gravy while the turkey is resting. Carve, arrange on a platter and serve.